Wise Registry Cleaner speeds up your PC by cleaning your Registry.The older your PC is, the more junked-up its Registry becomes. Badly written programs (and there are plenty of those around) don't bother to clean the Registry when you uninstall them, and some programs add unnecessary junk to the Registry. The more junked-up your Registry, the more likely it is to crash or to slow down your PC. 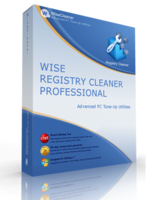 If you need more information please contact the developers of Wise Registry Cleaner Professional (WiseCleaner.com), or check out their product website.